● Poor quality (or few) buds, flowers or fruit. ● Distorted leaves i.e. cupped or twisted. * For information on nutrient toxicity (excessive EC). 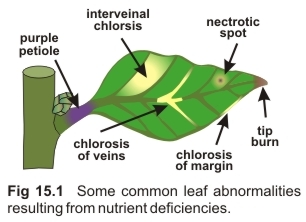 Mobile elements are able to move out of older leaves and into younger plant parts when a deficiency is present. Hence the symptoms usually occur first in the older (usually lower) leaves. Mobile elements include N, P, K and Mg (Chart 15.20). 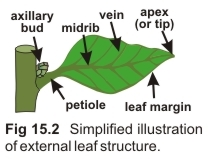 In contrast, immobile nutrients are not able to move quickly from one plant part to another. Therefore, deficiency symptoms are initially most obvious in younger growth (usually higher up the plant). 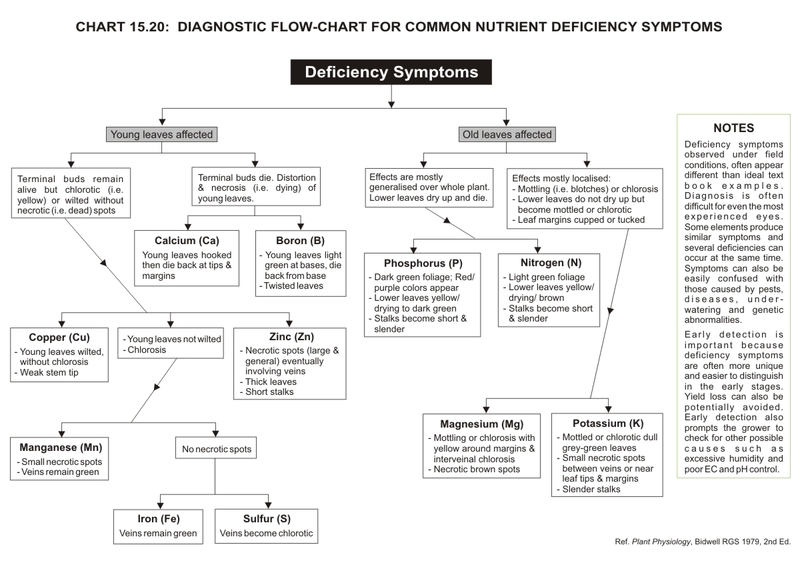 Immobile nutrients include Ca, S, Fe, Cu, Mn, Zn and B (Chart 15.20). ● Insufficient EC or feed frequency. ● In recirculating hydroponic systems, the nutrient is discarded too infrequently. ● Inappropriate nutrient pH: Causes certain nutrient elements to become unavailable for uptake. ● Excessive humidity: Hinders the distribution of nutrient throughout the plant. ● Signs of pests or diseases: Their presence can produce symptoms that are similar in appearance to nutrient deficiency symptoms.